If you’re the type of person who is attracted to places big on space and low on crowds, then Namibia will be right up your alley. It is the second most sparsely populated country in the world. (The first is Mongolia). However, the solitude is not the main attraction. Rather, it should be the spectacular natural beauty that lures you there. 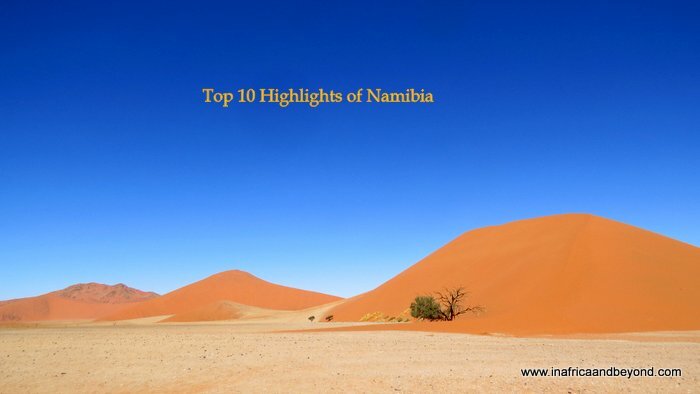 Namibia first made its debut on my bucket list, when I began seeing other bloggers raving about it. I must admit that it was a bit embarrassing to see travellers from Europe, Australia and the Americas exploring Namibia, whereas I, who lived in a neighbouring country, had not been yet. I finally made it there this year. Driving through Namibia is like paging through a coffee table book of spectacular landscapes, making it a country best explored by road. We flew to Windhoek from Johannesburg and rented a Toyota Fortuner from Hertz Car Rental, as they offered us the best prices. Fortunately for us, they also happen to be one of Namibia’s leading car rental companies. Our route took us from Windhoek to Sossusvlei and then north to Etosha, with several overnight stops along the way. Photos of Namibia usually depict the characteristic red dunes surrounding Sossusvlei and Deadvlei, part of the oldest desert in the world. The dunes can be accessed via the Sesriem Gate, which also leads to the Sesriem Canyon, a natural gorge carved millions of years ago by the river. 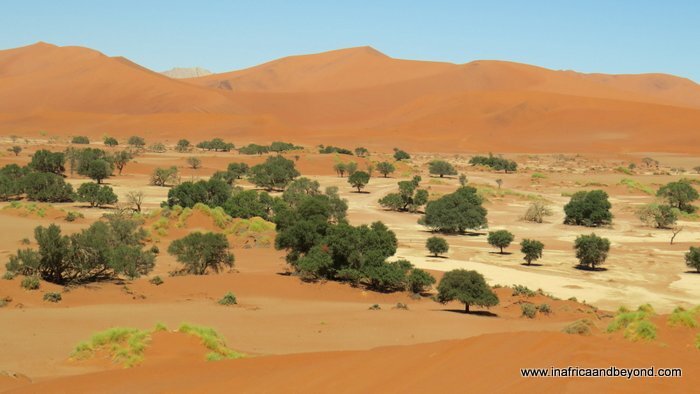 Sossusvlei is a salt and clay plan best known for the large, red dunes that surround it. These are some of the highest dunes in the world. Deadvlei is a spectacular clay pan with +/-900 year old dark, dead camel thorn trees contrasted against the white pan floor. Climbing the dunes and surveying our surroundings from high above was one of the highlights of Namibia for us. En route to Swakopmund from Sesriem, we stopped at Solitaire to refuel our Fortuner with diesel and our tummies with some world famous apple pie and coffee at Moose McGregor’s Desert Bakery. Solitaire is a desert settlement with a population of less than 100. It consists of little more than a petrol station, a bakery, and a general dealer and is artfully surrounded by rusting car wrecks. Soon after we had left Solitaire, we arrived at the sign proclaiming that we were at the Tropic of Capricorn. My kids had learnt about it in Geography and have already been to the Greenwich Meridian. So we were excited to show them the Tropic of Capricorn. Swakopmund is known as the jewel of Namibia’s coastline. It is a picturesque seaside town with a strong German influence. In fact, it feels more European than African. This is where the desert dunes meet the ocean, creating umpteen opportunities for adrenaline-filled adventures. We enjoyed walking along the palm-lined boulevards and the beachfront, and just experiencing the relaxed ambience in the town. It was also great to experience some city life after many days of driving through barren landscapes. Walvis Bay, near Swakopmund, is another picturesque coastal town. It is also one of the best places to see flamingos in Southern Africa. However, it is important to go at the right time of the year and the day, for the best sightings. Unfortunately, we did not get either of those right. Between Swakopmund and Walvis Bay is Dune 7, Namibia’s highest dune. I did not have the energy to climb it but my 12-year old son raced up in the midday heat. The infamous Skeleton Coast was named after the many ships that sank here over the past few centuries. We only drove along a short length of it towards the Cape Cross Seal Colony because the rest of it is not easily accessible. However, we did get to see the solitary wreck Zeila, near Henties Bay. Cape Cross Seal Colony is home to thousands of Cape Fur Seals. The day we went there happened to be a very rainy day, so we didn’t spend as much time there as we would have liked. But it was fascinating to watch and listen to their cacophony. Be warned though…it doesn’t smell good. On the road to and from the colony, you will see something equally fascinating – unmanned stalls displaying salt crystals in various shapes, colours and sizes, marked with prices. Containers are left to collect the money, which is presumably collected later. Wouldn’t it be great if this kind of honour system could work everywhere? 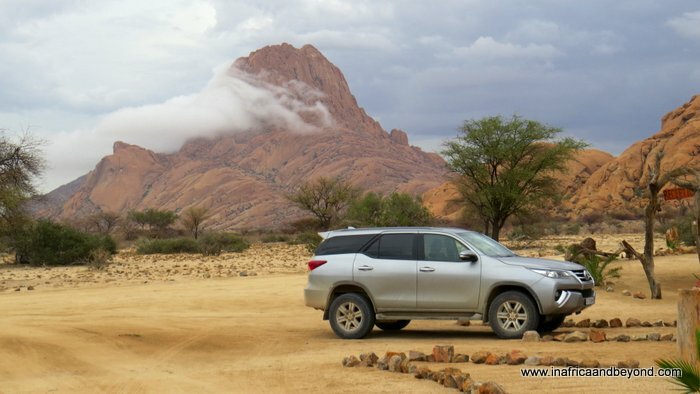 In the Southern Damaraland area, you will find a group of mountains with striking granite peaks and smooth boulders in unusual shapes and sizes. These are the Spitzkoppe Mountains. More than 700 million years old, the other-worldly mountains are among Namibia’s most distinctive landmarks and a must-visit for hikers, star-gazers and photographers. Stay at: Ondoruquea Game Lodge, or if you want something nearer and more basic, then stay at the Spitzkoppe Mountain Camp. Etosha is the oldest national park in Namibia, and one of the largest national parks in Africa. It is characterised by the Etosha Pan, a huge shimmering white salt pan spanning almost 5000 kilometres and a quarter of the park. It is the largest salt pan in Africa. Due to the flat, open landscape, game-viewing can be enjoyed thoughout the year. We went at a supposedly quiet time (April) yet we saw a lot. The award-winning Okonjima Nature Reserve is one of the most renowned private nature reserves in Namibia. It is also home to the AfriCat Foundation, a sanctuary for cheetahs, leopards and other carnivores rescued from angry livestock farmers. We went leopard tracking and found a beautiful leopardess and her cub. We also learnt about the foundation and what they do. These were the highlights of Namibia for us. 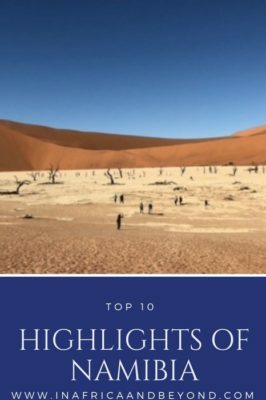 There are other attractions in the Southern part of Namibia which we didn’t get to visit yet such as Kolmanskop, Namibia’s most famous ghost town and Fish River Canyon, the largest canyon in Africa. These are on our itinerary for our next visit. Have you been there? What were the highlights of Namibia for you? Here are tips for travelling to Namibia. Click here for more accommodation options in Namibia. Oh this brings back so many amazing memories! I loooove Africa and going to Namibia was one of the best experiences I ever had. It’s such a beautiful country!!! What a beautiful place. Can’t wait to visit there- would love to see a leopard in a tree. Thanks Kat. I love seeing leopards in the wild too and this was the longest close sighting I’ve ever had. Your blog post made me really want to visit. I wanna see those “pages of the coffee book” landscapes. It sounds dreamy. Namibia looks incredible! Id love to visit there sometime. 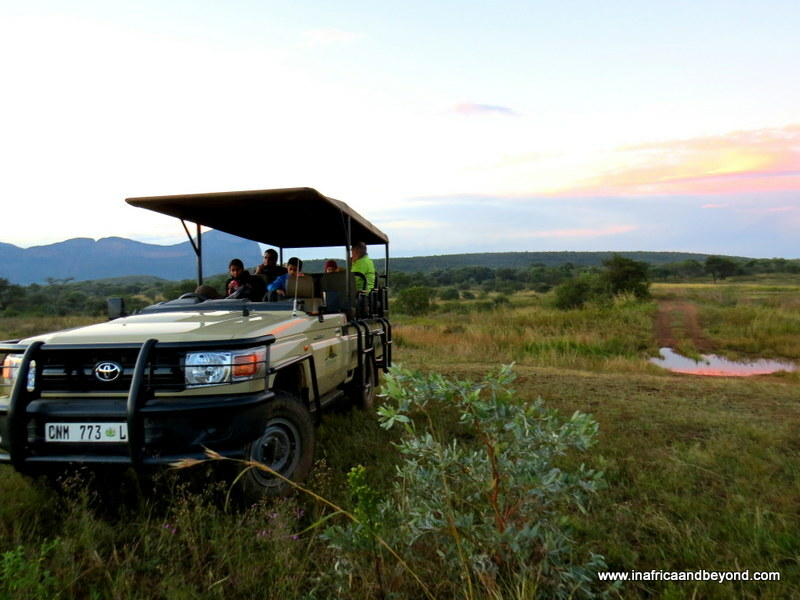 Wildife + Scenery – my 2 fave things! Thanks Leanne. Wildlife and beautiful scenery are two of my favourite things too – and Namibia has both in abundance!